Looking for a great gift for the princess on your list? 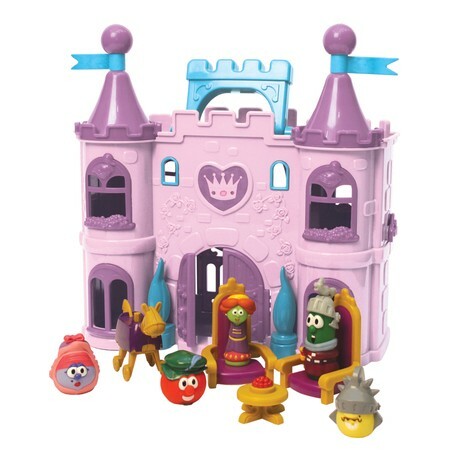 This amazing Princess Veggi e Tales Castle will have your princess busy for hours and hours. At first glance it looks rather small but don’t be fooled – this set is well made and great value for money. The figures are about 3” in size, the castle is 12″ tall! My daughter received this for Christmas from her aunt and uncle and loves it! You can get it at a great deal for only $19.99 at Christianbook.com. I don’t know how they make it for this price. They also have the movie Sweet Pea Beauty that goes along with this set at a great price too! Looking for a way to help bring stillness to your toddler, preschooler or young child’s prayers candle time might just be what you’ve been looking for! We belong to an incredible catholic married couples group called Teams of our Lady and are very blessed to be apart of a wonderful team full of incredibly beautiful, faith-filled couples. As part of our meetings we share how we are doing in different areas of our prayer life. Through this share we are regularly inspired to grow in different areas of our faith life. One of the beautiful things that some of the couples were doing with their evening prayers with their children was candle time. A concept that seemed simple and beautiful when we first heard of it, but one that went on the idea shelf. Well when our evening prayers started to become more like a circus act with our kids bouncing up and down and all about – this idea came to mind and changed everything! Nothing changes the atmosphere and mood of a room then light – we read our bedtime stories, then all gather to pray by candle light before the children go to bed – Now our prayers are much more peaceful, focused and still! The kids look forward to candle time each day and can’t wait to blow the candles out at the end of prayer time. When I took my daughter to a church bazaar this year after looking at everything she choose to spend her money on a beautiful candle holder and candle for prayer time – it was more then she had but the lady was so touched by why she wanted the candle that she gave it to her and my daughter proudly gave her a $0.25 and held it in her hands the whole way home excited to show daddy her new special candle!